3.1.3 How was Parson able to get into the Magic Kingdom? Parson A. Gotti, (born December 7, 1982 in Indianapolis, Indiana), or Lord Hamster, is a human gamer, and author of the webcomic Hamstard. Originally from Earth, resident of the city of Columbus, Ohio, he was summoned to Erfworld by Wanda Firebaugh in 3 AW, and appointed Chief Warlord under Stanley the Tool of Gobwin Knob. He was demoted to Warlord in 10 AW, and re-promoted to a Chief Warlord again in Book 2, Page 32. For choice and memorable utterances, see Quotes: Parson Gotti. "I have no problem with that, Tool." Sizemore seems to have been Parson's first friend in Erfworld. The two respected each other right away. Sizemore had never received any respect from a Warlord before, so he naturally treated Parson the way he would treat one of his fellow Casters in the Magic Kingdom. Sizemore's attitude toward Parson suffered when Sizemore was ordered to kill enemy units, but Sizemore seems to have forgiven Parson. Sizemore enjoys learning new ideas and performing new tasks, as long as they don't directly involve croaking people. He therefore appreciates Parson's capacity for suggesting ideas and activities which are new to Erfworld. He knows that associating with Parson is likely to increase the rate at which he levels. But he is also apprehensive about Parson's capacity for mass slaughter, and dislikes the effect Parson's innovations are having on his relations with the casters in the Magic Kingdom. While Janis helped him come to terms with the death toll produced by "uncroaking" the volcano, he knows he may find it harder to forgive what Parson makes him do in future battles. By the time the Siege of Spacerock is over, Sizemore shows a great deal of antipathy, and Parson acknowledges that Sizemore probably hates him now. Stanley is aware that Parson is the "Perfect Warlord", and is therefore capable of defeating vastly superior armies by devising radically innovative strategies. But despite this fact, he is deeply ambivalent about allowing Parson to act as Gobwin Knob's Chief Warlord. He knows he can't predict what Parson will do if he gives him the authority to act, but he suspects that while Parson will achieve victory, that victory will come at a higher price than Stanley wishes to pay. He is deeply unhappy that Wanda became attuned to the Arkenpliers as a consequence of Parson's first victory, and is likely to be even more unhappy if Parson's second victory allows Wanda to take control of most of Stanley's Dwagons. Parson dislikes Stanley, who reminds him of every bad boss he ever had in his old life on Earth. He has almost no respect for Stanley beyond his ability to kill him/get him killed. It was recently revealed in LIAB Text 44 that while Stanley recognizes how good a warlord Parson is, he also believes that were he to recognize subordinates it would cause them to slack in their duties. He does have a few complaints such as how expensive Parson's plans tend to be and the occasional mistakes that result from his inexperience. Stanley is also struggling with his position. He has often commented that he was happiest when he could go out to tame dwagons, fight battles, rock out, and generally be an active part in the dangers of his side. As an Overlord he must avoid any dangerous active role while his subordinates do all the things he wishes he could do. Jack and Parson seem to be quite cordial. They haven't been seen having much interaction until recently. Parson seems to understand about two thirds of Jacks witticisms, which is more than most people. They have worked together to develop new tactical concepts, with Jack using his Foolamancy to visually simulate the movement of units and outcomes of battles as calculated by Parson's Mathamancy bracer. Since they started the simulations, Jack's opinion of Parson has risen dramatically. At one point he muses that Parson explaining the phrase "lateral thinking" to him is enough for him to consider himself forever in the warlord's debt. Parson considered Jack to be one of the few people he trusted. But with Jack's Decryption, Parson worries that Jack has become little more than Wanda's puppet. Bogroll was intensely loyal and devoted to Parson. Bogroll claimed that his greatest wish would be to save Parson's life. Parson became fond of Bogroll, though he found interaction with him awkward. Bogroll's death in combat played a major role in Parson's eventual decision to discard his Sword of Ruthlessness. Ace Hardware met and fought Parson Gotti of Gobwin Knob in the burning court of Spacerock shortly before he was croaked. As a newly decrypted unit of Gobwin Knob, Ace seems to be very impressed with Parson, his new Chief Warlord. He finds Parson's large size and his way with words very appealing, and he is eager to improve Parson's twoll-made gear using his powers as a Dollamancer. In the short span of time since his decryption, Ace already seems to be very loyal to Parson. He desires to protect Parson from the Magic Kingdom's free casters. Apparently Parson is a Heavy Unit and cannot ride a Mount.Erf-b1.5-p032 Being formerly both a Heavy and a Garrison Unit, he was incapable of leaving Gobwin Knob on foot or mounted. Parson was able to pass through the portal to the Magic Kingdom, something that as a Warlord should have resulted in his immediate disbanding. Once there he is identified as a Hippiemancer by a Grand AbbieErf-b1-p140-p8 . Whether this suggests he has additional abilities he is unaware of, reflects his unique and anomalous properties in Erfworld, was a lie by the Grand Abbie used to defuse a tense situation, or something else entirely remains to be seen. However, Parson has had street signs put up in Gobwin Knob. Erf-b1.5-p044 Since Signamancy is a form of Hippiemancy, this may be significant. Theoretically he could use the Magic Kingdom to move between cities much as a Garrison Caster would, but the casters in the Kingdom are leery of having a Warlord use the portals because the Magic Kingdom wants to remain neutral. 1. He is no longer subject to the effects of the Summon Spell (or at least the Thinkamantic portions of it). 2. Erfworld has rewarded him for services rendered. 3. He can use willpower to fight Natural Thinkamancy. Despite having presided over the destruction of the entire alliance army, Parson did not level; however, he had only croaked one thing directly himself (a Wiener-Rammer), and has directly presided only over battles from which he retreated, which would prevent him from leveling. This includes the Volcano Uncroaking event, in which all of the actual dying by Royal Crown Coalition occurred while Parson was in the Magic Kingdom. It is further made unclear because aside from the stats listed in his stupid meal his stats can't be viewed as other unit's stats can be. At the end of Book 2, he rises to level 3 after destroying a doll and croaking King Slately's duplicate. Parson was previously a Garrison Warlord and it was thought that he would have to be promoted to a Field Warlord by Stanley (who was not inclined to do so) in order to gain the ability to move between hexes.Erf-b1.5-p009 However, this requirement has been proven false since Parson was able to use his authority as Chief Warlord to promote himself to a Field Unit rather than waiting for Stanley to do so. This may be considered yet another example of Parson's lateral thinking, as detailed below. Being a Field Unit, Parson's Upkeep is now 140 Schmuckers higher than before. Rising to level 3 presumably increased it slightly more. By book 3, his upkeep becomes a total of 1178 Schmuckers. Before Parson was brought to Erfworld, he had spent six months designing a turn based strategy game. This game was intended by Parson to force the players to employ lateral thinking. There was no way they could win the game, and defeat Parson, except by coming up with some radical new strategy which Parson (the Gamemaster) hadn't thought of while he was designing the game. Because Parson is the "Perfect Warlord", many readers expect him to ultimately "win" the game which is Erforld, by conquering the world. But it may be that Parson's real Fate is to force the people of Erfworld to develop their capacity for lateral thinking, to the point where they can defeat him, in the same way he originally planned to force his friends to develop theirs. It has been long speculated that Parson may be a Signamancer, based on a variety of factors: His ability to decipher a scroll sent to him by Charlie, Signamancy being Fate-aligned Hippiemancy, Janis's claim that he is a Hippiemancer, and perhaps the nature of Signamancy itselfErf-b1.5-p037 which meshes very well with Parson's ability to come up with new powerful (described as 'disturbing') game-changing strategies in Erfworld's reality. It is possible that Janis's claim is based on Parson's true nature, that is he is a gamer as opposed to and in addition to being a playing piece in a world bound by game like rules. 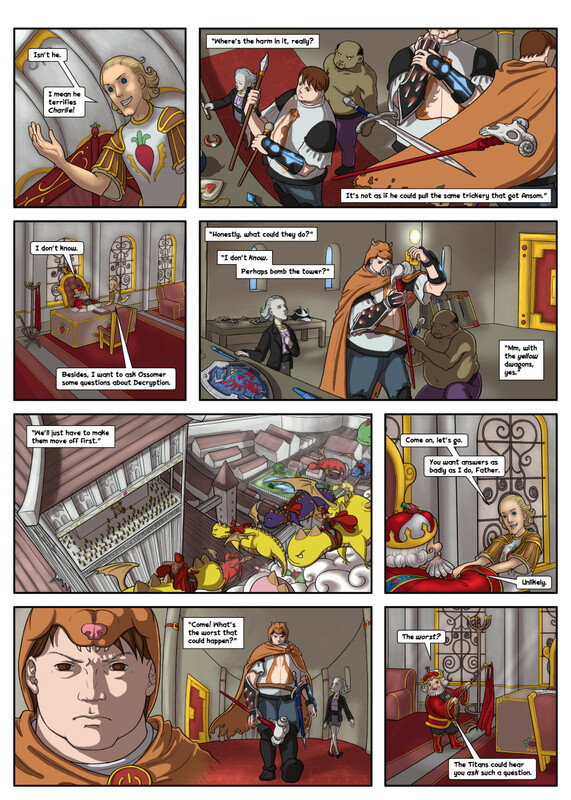 Paradoxically as both an outsider and an expert, the significance of many aspects of Erfworld are quite clear to Parson in that he naturally looks to what everything in Erfworld signifies not what they "are". Parson appears to conduct many signamancy experiments. These are countless, but examples are fun: When intoxicated, he decides to take a short flight across Gobwin Knob's quad. If a powerful signamancer, he is deciding to risk his life in a signamancy experiment to see what happens when a flying unit that is mountable, a dwagon, is ridden by a large, non-flying garrison unit with zero move. He has conducted and continues to conduct what appear to be signamancy experiments, such as what happens when you leave a hex with zero move LIAB Prologue 6 , attempt ranged attacks with no unit special ranged attack (bracer scenario) , blowing up Gobwin Knob  , etc. With each experiment, he has proven his perception of the underlying game rules via Signamancy are real and can be taken advantage of. For example, he set up chains of ranged fliers to cross hundred of hexes 'pony express style' in a single turn, defeated an entire army by uncroaking a volcano, and even disobeyed a direct order from Stanley without disbanding  (this last one is Special for reasons we won't go into here, but will below in "Parson the Natural Caster"). And in case you missed the italics (above), it is also important to note that like archons and all such special units, Parson's power appears to be natural Natural_Thinkamancy, that is he appears to be a natural signamancer. As a natural caster, Janis's claim that he is a Hippiemancer seems sound and more to the point, he appears to be an extremely powerful natural signamancer. This is perhaps often missed by fans of Erfworld for three reasons. First, because Erfworld fans share Parson's powerful natural signamancy with regard to how they interpret Erfworld. Because after all, signamancy is all about interpretation of signs as signals to seeing the reality that underlies what is taken for granted, aka insignificant, by others, perhaps much like Enlightenment  in our reality. (This also might explain why its called Hippiemancy for obvious allusions.) Second, as a gamer and a game piece in a world bound by game like rules, Parson, like the reader, can see and understand the difference between social customs as distinctly separate from game rules. (Note: Charlie, who like Parson is also known as 'not normal' with a thinkamancy artifact may be able to catch on to Parson). Third, because Signamancy mechanics do not appear to change Erfworld the way other magics operate. For example Croakamancy directly makes croaked units into uncroaked units, rather Signamancy appears to give insights (see the signals) into how the existing Erfworld works that later can then be exploited by "non-magical" actions (perhaps not unlike Enlightenment). Perhaps part of Parson's apparent Signamancy ability is that he can also expertly parse signs (Perhaps a pun on his name Parson.) That is to say his ability to determine "the relative importance or prominence of a piece of a sign", semiotics,  in the great mix of signs everyone sees everyday. This is perhaps best demonstrated when as the "Perfect Warlord", or equally plausibly as a natural signamancer/warlord, in Book I page 124  speaks to how he parses what he sees for war to win back the trust of his fellow(?) casters. Finally, this perhaps explains many of Parsons relationships. He appears most comfortable in relationships with casters, Bogroll a notable exception. For example, his two closest companions in Erfworld are both casters; Maggie, who repeatedly notes he is a very different sort of warlord, and Sizemore, who stated very early on that he had a deep interest in all kinds of magic. It is possible that Sizemore's interest in Parson could be a subconscious reflection of this. Parson's comfort with them appeared most significant during a drunken Signamantic(?) conversation about the nature of time in Erfworld. Last but not least, Signamancy would explain why he understands much of Jack's, the Foolamancer's, cloaked speech. As a Signamancer he would naturally be able to see clearly to a Foolamancer's cloaked meaning. Most significantly, in LIAB Text 59, the page which reveals Parson's casting ability, it states that Parson can now understand some of the things behind what he can see. It might just be referring to his new senses as a general caster, but it could also be referring to the basic power of Signamancy. This is further supported by the fact that he could actually interpret and fully understand the scroll Charlie gave him, a feat Sizemore and even Isaac could not. How was Parson able to get into the Magic Kingdom? Parson is a "potential" or "nascent" caster. In Erfworld casters are popped as fully formed casters not born in a nascent undefined form as Parson the Earth human. If this is what he was to his own bracer scenario, until he successfully unlocked/initiated the casting of his first spell. he may have appeared to be a undefined caster to the magic portal and not to a regular popped caster to other casters, or the bracer which attempted to define his type and discipline for the scenario. Fate needed to keep Parson alive and used natural Carnymancy to bend the rules enough to make him immune, which is the scenario suggested by Janis. That Parson is *special*, possibly as a consequence of being a Stupidworlder and/or Perfect Warlord, resulting in an immunity to disbanding. Being from Stupidworld, Parson is subject to the Law of Conservation of Mass, which states that matter can't be created nor destroyed. When he uses a portal, it tries to disband him, but eliminating his matter in this way is physically impossible. Parson is named after his grandfather: whether this is his maternal or paternal grandfather is unknown. "Parson A. Gotti" is an anagram of "A protagonist". "Parson" is a type of clergy. John Gotti Was an organized crime Boss. His upkeep is 1178 Shmuckers a turn. By comparison, the strongest Archon unit has an upkeep around 500 Shmuckers a turn. We don't know what the average upkeep for a high-level warlord is, but one full grand per turn was high enough that Stanley found it irritating (but not completely outrageous). Parson's birthday is the day (25 years to the day) that Erfworld was originally launched on Giant in the Playground. Parson appears to enjoy listening to Beck ("Loser" is the song that plays as his alarm) and Jonathan Coulton ("Re Your Brains" is the song playing in his car on the way to Kinko's). However, it is possible that Parson enjoys Beck to no greater degree than being willing to set his alarm radio to a station that will play Beck, given that at the time of the comic's beginning radio alarm clocks were far more common than MP3 alarm clocks. "Re Your Brains" is unlikely enough to be playing on a car radio station that Parson most likely chose to play it in the form of a mix CD or an MP3. Parson is a comic character who wrote a web comic, and designed a chit-game. He is summoned into a chit-game as a warlord character who attempts to overcome the paradigm of the chit-game, but remains unaware of the web comic paradigm. This page was last edited on 12 January 2018, at 23:44.